Collection of modern park benches and unique bench designs that will help you take the weight off your feet and relax in style. 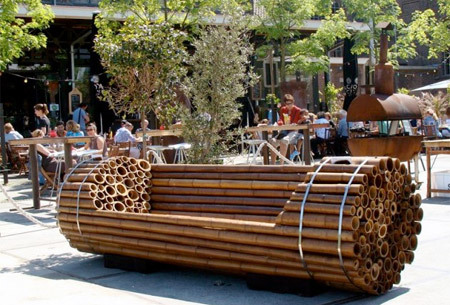 Beautiful park bench designed by Pablo Reinoso from Argentina. 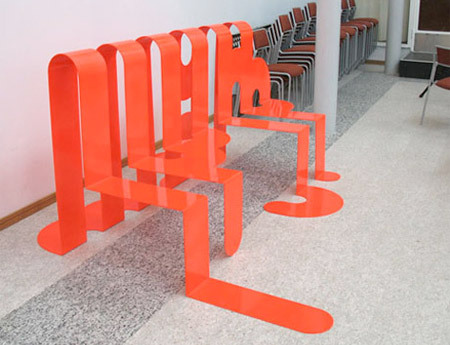 You have to insert 0,50 EUR to sit on this creative private bench. 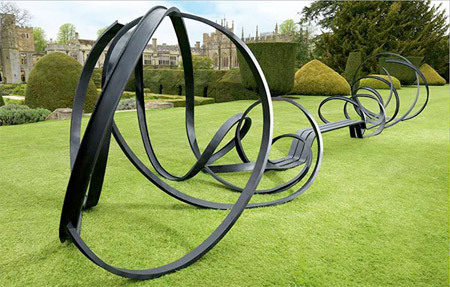 Cool bench with a familiar line which suddenly undulates and bends to propose a flexible and relaxed seating on half of its length. 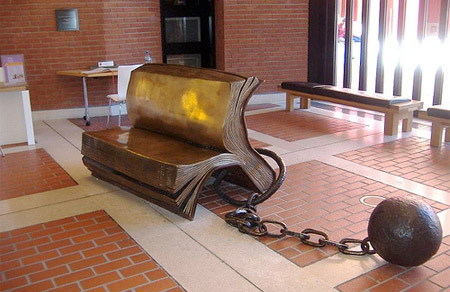 Creative bench found in the hallway of the British Library in London. 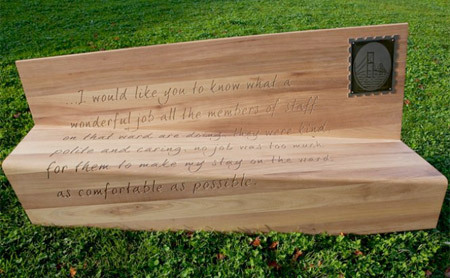 Located at a hospital in Bristol, this bench was inspired a folded postcard from an actual letter sent by a patient. 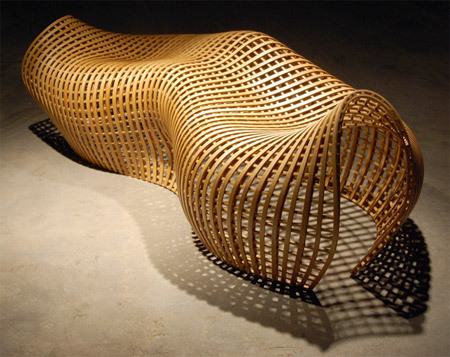 Stylish bench by Matthias Pliessnig is made from bent white oak. 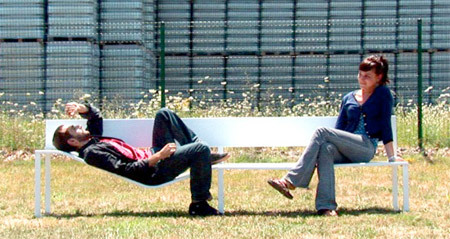 Built to celebrate the launch of Panasonic’s Lumix compact camera, this cool park bench is big enough to seat 14 adults. 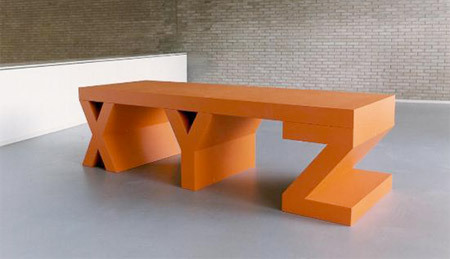 Modern bench created by a talented Dutch artist Marc Ruygrok. 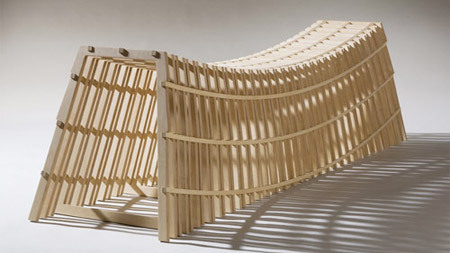 Stylish bench inspired by the roofs of traditional Korean homes. Combines clean lines and a framed opening for stones or shallow rooted flora such as grasses. An ideal piece for either indoor or outdoor use. Unusual bench created by The Mighty Bearcats design group. 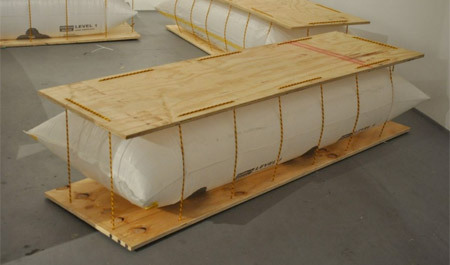 Bamboo poles are strapped together with 4 stainless steel rings. 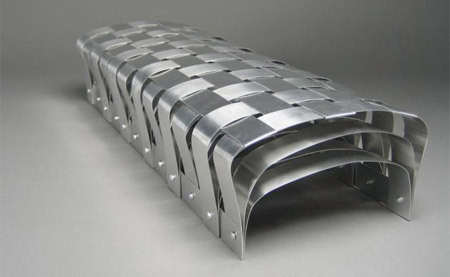 Stylish bench by Can Onart is made from aluminum sheets that have been sanded to give a texture similar to steel. 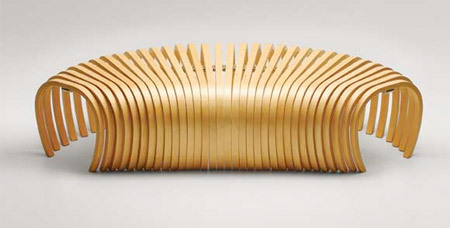 Creative bench designed by Peter Thuvander for the Conceptual Design Exhibition at the National Gallery in Stockholm. That spikey bench would get immediately vandalised. 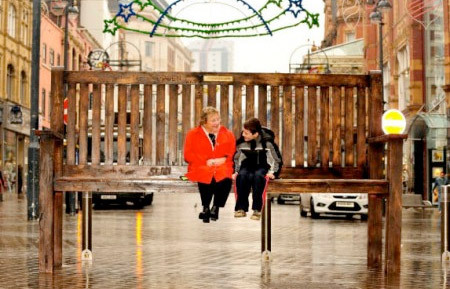 The Pay & Sit bench is a terrible idea. Some kid is going to get hurt and the manufacturers are going to get sued to oblivion. Imagine what if the mechanism/alarm malfunctions? 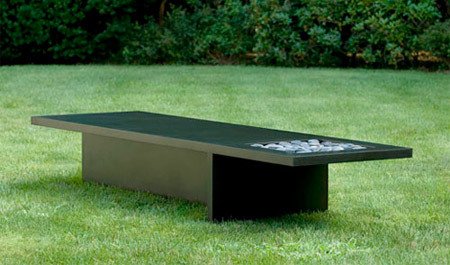 I like the Muugano bench because there various ways to sit on it. What’s the meaning of pay & sit!!? Private bench in a public place!? I think the pay-bench is to discourage homeless people from camping out on them. Just what we need… hostile furniture in our parks. Kind of reminds me of the way Mao killed all the birds in China by instructing the People to shoo them away whenever they landed. Next year, famine! What will happen if the homeless all die from having no safe place to rest? Great stuff, I’d hate to fall asleep on the pay and sit. @Zino rather than discouraging homeless people, it would get vandalised by some homeless for the coins. would crash that happily. wth on the pay and sit bench…? what if an elderly was tired and had to rest? imagine all the stupid accidents that can come w/ those spikes. so what if the bench is yours and private. pigeons would still have the opportunity to poop on it, and the weather would still wear it out anyway. how selfish can one get? bring your own furniture if you want private seating. really disappointing to have a pay to sit bench. instead of being able to rest and sit comfortably you need to pull out your wallet find the right change and make the effort to pay the money to sit on a bench. all the while you try to relax you will have the timelimit on the bench in the back of your mind. okay the pay and sit was really dumb cause i dont know about most people but i dont take my wallet to the park!!! and it was also kinda stupid cause what if your a jogger and your supper tired and obviously dont carry around quarters? or if your a kid and dont have any money? or what happens if a blind guy comes and dosent know theres spikes? or what if you are homeless where are you ganna sleep? the ground? seriously? PAY AND SIT! that even sounds dumb!! i mean really maybe in a few years we will have to freakin pay for every thing!! im sorry but some people cant afford to pay for everything!! i think sitting down shouldnt cost a penny!! i would never sit on the PAY AND SIT even if i was an billionare! no offence but the creater of the PAY AND SIT obviously didnt think things through!! Sit on back rest, feet between spikes on base, lean forward onto knees, problem solved. the pay and sit bench is a horrible idea!!! Next they’ll be installing spikes under particularly shady trees and charging money for enjoying that too! Some people are so stupid. im almost tempted to consider the pay and sit bench being some sort of life-trolling. BUT. its an awesome bench, i just dont like that you have to pay. but you have to admit, someone put a lot of thought into that. and you can just bring an old pillow and sit on it, the spikes will not go through all the way if the pillow is big enough. What’s the purpose of the Pay & Sit Bench? The only people who would use that are those who are rich enough to pay just for SITTING, or those who are curious enough to see how it works. It’s like a scam just to see how stupid some people are. And aren’t those spikes dangerous?? Why is there nothing like this in Toledo, Ohio?